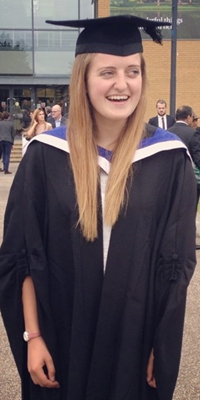 MMus Music (Composition) student Kirsten Parry shares a typical week for her as a postgraduate student at Surrey. The following timetable is a personal example - for the latest module information, visit the MMus Music (Composition) programme page. A typical specific weekday will involve waking up around 7:30am, eating a good breakfast and cycling to campus for 9am (if I have lectures). I generally stay on campus all day so bring lunch with me, but if I need food I can rely on Simply Fresh, the university’s very own fresh produce store, for lovely, inexpensive food. Whenever I need to de-stress on campus, I enjoy walking down to the Students’ Union and grabbing a hot drink from Teas and Tees, because the President and Sabbatical Officers are such friendly faces who don’t mind students dropping in at any time. Also at the Union is the Front Room, which is a common room space with plenty of sofas, board games and opportunities to relax – especially when the Happiness Café runs every Wednesday afternoon. In warmer weather, I like to go and sit by the lake or walk into town by the river. I generally do my work in the Music Department (PATS), but if I need to do some very quiet, focused and research based work I go to the Library. I think it’s important to try not to do too much work at home, especially in the room that you sleep in, because this can form negative associations and affect relaxation time. Other activities related to my course include studio recording, extra sectional rehearsals, using the practice rooms, committee meetings for Gospel Choir, study sessions with friends and other miscellaneous work jobs. Although these aren’t necessarily weekly commitments, they are regular happenings and contribute to the varied life that I have here at University. Concerts generally happen at the end of each term, and I am involved in various performances including classical choral concerts and contemporary music showcases. I have no lectures or rehearsals on a Monday; a rare thing! So I take the opportunity to have some space from campus, doing research at home before going for a walk or meeting up with friends. I live in north Guildford very near a large common, which is perfect for headspace when I feel stressed. Although my course is taught, not research-led, there is much research to be done and I enjoy having quiet time to myself to read and reflect. Although this is a heavy day, it’s helpful to get most of my lectures out of the way so that I can organise my time efficiently the rest of the week. As a Student Ambassador for the University, I often work on a Wednesday, which is when we have Applicant days for prospective students to gain a taste of what their course would be like if they were to study here. The Music Department also puts on a weekly lunchtime concert which I either attend or perform in, and I have University Choir rehearsals in the evening. Again, I have no lectures on a Thursday, so take the opportunity to complete any work that needs to be done before the weekend and work on some long-standing coursework pieces. As a composer, it’s vital for me to constantly be writing music, and I use the edit room facilities in the Music Department to do my work. I also hugely value one-to-one time with my lecturers in the form of tutorials; as a Music student, tutorials are imperative to my learning and development. I have tutorials most weeks to check that I’m on track with my coursework, to share research ideas and to present recently written compositions. On Thursday evenings I go to Jazz Orchestra, which is a student-run ensemble that I really enjoy partaking in for fun. I have Digital Improvisation from 9am till 11am, and as Musical Director for the University of Surrey Gospel Choir I lead our weekly rehearsals on a Friday evening. This means that I may well spend Friday afternoons preparing for the rehearsal, arranging new songs and learning parts. My weekends completely vary; I may visit friends who are on placement, go home and see my family, or have a quiet one in Guildford, going to town to get anything I need or seeing friends. I try to keep work to a minimum at the weekend but around deadline and exam time, it’s inevitable that I will need to do some work! I thoroughly enjoy my day-to-day life as a Postgraduate student at Surrey, and although it feels much busier and more focused, the general structure of the day and the activities I partake in are not all that different from life during my Undergraduate degree. We are expected to manage our time efficiently, doing plenty of work but steadily, so as to avoid unnecessary pressure around the exam and deadline period. Tutors and lecturers are equally supportive, perhaps even more so, and social opportunities are vast. It’s all about time management, priorities and being kind to yourself – we do not exist purely to work, University is about the holistic life experience too and should be enjoyable in every aspect! Learn more about our Music degrees, including our MMus Music (Composition).